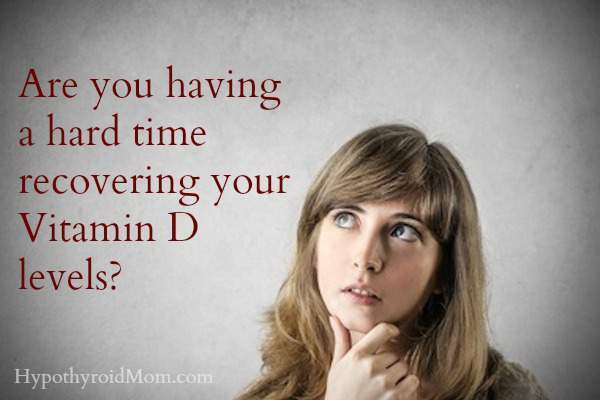 Are you having a hard time recovering your Vitamin D levels? It is estimated that over half the population is deficient in Vitamin D, most of them undiagnosed. A 2013 study in the International Journal of Health Sciences indicated that Vitamin D deficiency is associated with hypothyroidism. Even when we are fortunate to have a doctor test our vitamin D to determine we are deficient, how much should we take? What is the optimal Vitamin D range? What is the best type of supplement to take and when? Angela Pifer shares important tips to discuss with your doctor to get you to optimal. I often see a vitamin D supplement listed among the current supplements on my patient’s intake forms. After reviewing their past labs and assessing their dose, I don’t often see an appreciable increase reflected on their labs over time. They may have been taking 2000IU of vitamin D3 daily for the past two years and yet their labs only show a shift from 22ng/ml to 25ng/ml. What I find is that they are usually taking a vitamin D3 supplement in a soft capsule form, often called a ‘gem,’ and they are taking it in the morning and not in the evening. Many of my patients are surprised to learn that even though vitamin D is called a vitamin, vitamin D is really a hormone and not actually a vitamin. In fact, it is a fat soluble hormone. For optimal absorption, the oral supplement “Vitamin” D3 is best taken as a liquid emulsion with dinner. A liquid emulsion is simply a vitamin D3 supplement suspended in a little fat. This is a fat soluble hormone, so taking this as a liquid emulsion improves the absorption and taking this with dinner, which often has the most fat of all the meals, improves the absorption as well. You’ll only need a tiny drop or two of the liquid emulsion on your tongue, as this usually has 1500IU or 2000IU of vitamin D3 per drop (check the label). Since this is a hormone, it is best taken at night, because hormones are best absorbed at night. WHAT IS THE OPTIMAL VITAMIN D (25 OH) RANGE? If you have had your vitamin D levels tests, your doctor most likely tested your 25-Hydroxy Vitamin D levels. On your lab this will be listed as “Vitamin D (25 OH)” or “25-Hydroxyvitamin D (25OHD),” or “25(OH)D,” but these are the same test. Even though the lab may report an adequate level of vitamin D as 25-30 ng/ml, the optimal vitamin D range is 45-65 ng/ml. In addition to taking a vitamin D3 liquid emulsion at night, taking the right dose to raise your Vitamin D (25 OH) levels up to your goal is also important. A few small studies have shown that 2000IU vitamin D3 taken over three months, will raise Vitamin D (25 OH) levels by 20ng/ml. This may be the reason that many doctors prescribe this dose. Clinically, this doesn’t play out. Some people will need a lot more vitamin D to raise their levels over time. 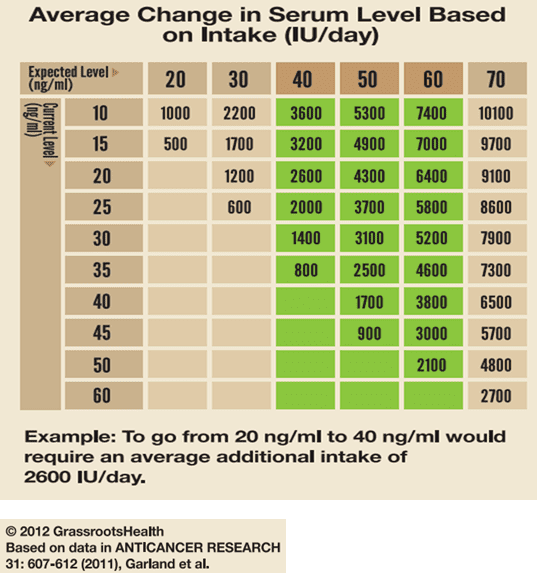 If your Vitamin D (25 OH) is 25ng/ml and your goal is 45ng/ml, move to a liquid emulsion, taken with dinner and try a 2000-4000IU dose for six months and then retest. Assess how much your vitamin D level moved during that duration and then work with a licensed health care provider to reassess your dose. Once you reach your desired level, you will likely need 1000-2000IU vitamin D3 a day to maintain these levels. You can use the chart, which offers guidelines for dosing, based on where you are starting and where you want to go. I have found these dosages to be more relevant clinically. Vitamin D3 should never be taken alone. Always take a combination Vitamin D3/Vitamin K2 liquid emulsion like this one from Pure Encapsulations. This is because vitamin D3 improves calcium absorption across the GI tract and vitamin K2 is the cofactor needed to transfer calcium into your bones, and not your arteries. Angela Pifer is a Functional Medicine Nutritionist and Licensed Certified Nutritionist with a Master’s in Nutrition out of Bastyr University. She has been a practicing nutritionist in Seattle for over a decade. Her 25 years in the health and fitness industry and the past 10 years as a functional medicine nutritionist focusing in the areas of weight loss, digestive health, inflammation, and metabolic conditions, have earned Angela recognition as the go-to weight loss expert. She is founder of the Clean & Lean Revolution. I was found vitamin D deficient last week. My supplement is coming in the mail tomorrow. I am going to be taking 1500 IU vitamin D and 600 mg calcium as calcium citrate. I find it easier to digest, as the acid is built into it. With calcium carbonate, you have to supply the acid to break it down. Since i can’t depend on my stomach acid to digest it, calcium citrate is a good alternative for me. This supplement also has vitamin K in it, as well as magnesium, Boron, and a few other things required for good bone growth. My hair has not been so full lately, I have a headache, I’ve been tired and depressed, and my balance has been off. I hope my hair will grow back once my D levels are up to par. My Vitamin D levels were checked 6 months ago they were barely over normal. I started on 2000 iu x2 twice a day. I just had my levels checked again and they are now below normal. My doctor recommended 3000iu daily. I have Hashimotos, sjogrens and rheumatoid arthritis. I am 41 seems like alot going wrong at my age!